Great Danes tend to have placid dispositions. Great Danes are massive, sturdy canines that are common companion pets in households around the world. Despite the awe-inspiring exteriors of these dogs, they generally possess measured and amiable overall temperaments. But, although the word "Dane" is indeed a part of their name, these pooches hail from Germany, not Denmark. 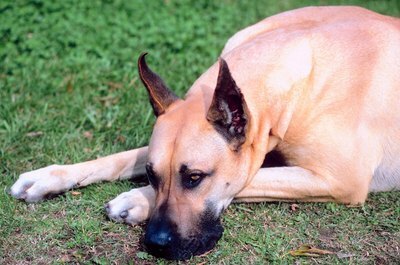 Great Danes are believed to be a blend of English mastiff and Irish wolfhound breeds. The breed was initially established for purposes of hunting wild pigs. Although great Danes were employed for some time as hunters, their duties gradually shifted to those of watchful guardian animals. They previously were referred to as "boar hounds" due to their pig-hunting obligations. In a nod to the famed figure of Greek mythology, great Danes are often lovingly referred to as the "Apollos" of the canine world thanks to their tall, regal posture and graceful physiques -- not bad. One of the members of the great Dane breed has the distinction of being the tallest dog on the planet, notes the Guinness Book of World Record's 2013 edition. The Michigan-based pooch, named Zeus, is 44 inches in height, starting from his feet and going all the way up to the most elevated portion of his back. For the most part, great Danes can live successfully and harmoniously alongside fellow pets and children. However, it's always important to closely monitor great Danes in the presence of young kids, just as it is with all breeds of canines. Since these dogs are so immense, they can easily accidentally push over wee children. These family-focused animals adore the familiar human beings in their lives, but can sometimes be suspicious, wary and aloof with newbies. These working dogs are enormous, so it may seem that their food intake would be of similar enormity. This isn't the case, however, as most great Danes consume similar amounts of food as canines of smaller and more "normal" body size. When they're young and growing rapidly, however, they do need lots and lots of food in their bellies. Great Danes' physical fitness requirements are also close to those of normal-sized canines. Short outdoor runs or lengthy outdoor strolls are both appropriate options for a great Dane's daily exercise regimen. Male great Danes are usually slightly taller than the females. The males are usually at least 30 inches in height, while the females are generally at least 28 inches -- taken from the shoulder region. They appear in an assortment of colors, notably black, blue, brown and pale yellowish-brown. Bi-colored black-and-white great Danes also are common.